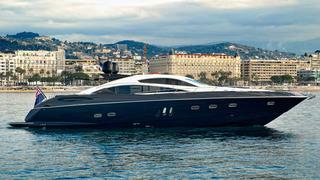 Spencer Brown at Sunseeker Poole tells me he's signed the 25m motor yacht Low Profile for sale. A Sunseeker Predator 82, Low Profile boasts a dramatic exterior and her interior in black American walnut accommodates eight guests in a master suite, VIP stateroom and two twin cabins. Twin 2434hp MTU engines give her a cruising speed of 30 knots. Lying in Menorca, Low Profile is asking £1,395,000.